Director – Daniel Espinosa, Screenplay – Richard Price, Based on the Novel by Tom Rob Smith, Producers – Ridley Scott, Michael Schaffer & Greg Shapiro, Photography – Oliver Wood, Music – Jon Ekstrand, Visual Effects – Image Engine (Supervisor – Chris Harvey), Special Effects Supervisor – Pavel Sagner, Production Design – Jan Roelfs. Production Company – Scott Free. Moscow, 1953. Leo Demidov, a hero of World War II for being the first person to plant the Soviet flag over Berlin, is an officer of the MGB state security force. He is given orders to break the news to fellow officer Alexei Andreyev that his son has been killed in a train accident. Leo is certain that the death was a murder but is told by his superiors that murder is a capitalist disease and would not occur in a Soviet paradise. He is then asked to investigate his own wife Raisa as a subversive but can find no evidence that she is. For refusing to renounce her, both of them are exiled to the remote mining town of Volsk. Working there under General Nesterov, Leo uncovers a string of other child murders, some 44 in all, that have occurred up and down the train lines. Risking being listed as an enemy of the state by returning to Moscow, Leo goes out on his own, determined to track the killer. Child 44 (2008) was a debut novel from British writer Tom Rob Smith. The book was a best-seller and received several awards when it came out. Smith has written two sequels featuring the same detective hero Leo Demidov with The Secret Speech (2009) and Agent 6 (2012). The film version of the book was made by Daniel Espinosa, a Swedish director of Chilean origin who had gained international attention with his third film, the thriller Easy Money (2010), and was previously brought to the US to make the crime film Safe House (2012). The film is produced under the Scott Free production company banner of Ridley Scott. It received theatrical release in many countries but in the US only did limited theatrical screening before being dumped direct to dvd, while it was refused screening in Russia because its portrayal of Russian history and culture was considered insulting. Child 44 is set in a milieu – the Soviet Union during the reign of Joseph Stalin – that is a highly original one for a police procedural. It features one of the most fascinating detective heroes since surely Xavier March in Robert Harris’s Fatherland (1992) and played by Rutger Hauer in the heavily disappointing film version Fatherland (1994), which offered up a detective hero who was an SS officer. The production design, costuming and visual effects team have done a superlative job in recreating the dreariness of the era – the propaganda posters, the vehicles, the drabness of the costuming. Everything feels like you are really are back in the world of the Soviet Union with its constant atmosphere of paranoia, distrust, informers and enforced loyalties – it rapidly becomes one of the most fascinating milieus to watch a detective story take place. Of course, much of this resembles the Arkady Renko stories by Martin Cruz Smith – no relation to Tom Rob Smith – a much superior series of books beginning with Gorky Park (1981) about a police detective in Soviet Moscow (albeit set some two decades later) and seven successive books that follow the hero through various outliers of the Communist State and the collapse and aftermath of the Soviet Union. Tom Rob Smith has appropriated the story of the Ukrainian serial killer Andrei Chikatilo, a former schoolteacher who murdered 52 children across the Soviet Union but whose activities remained largely undetected due to his moving around the country via train. The Chikatilo story has appeared on film several times before with Citizen X (1995) and Evilenko (2004). It should be noted that Child 44 is a widely fictionalised version of the Andrei Chikatilo story. Chikatilo’s killing spree occurred between 1978 and his arrest in 1990, the majority of which was well into the era of perestroika and where his arrest was concurrent with the fall of the Soviet Union. Smith has moved the story back twenty-five years to the height of Stalinist oppression. Moreover, where Chikatilo was in actuality arrested and then executed some years later, the film offers a very different fate. That said, the script and novel have borrowed the core of the Chikatilo case – where he was allowed to go free for many years because the Soviets refused to accept the idea that murder would occur in a Communist paradise and where he was freely able to move up and down the train lines undetected because he was a minor party official. 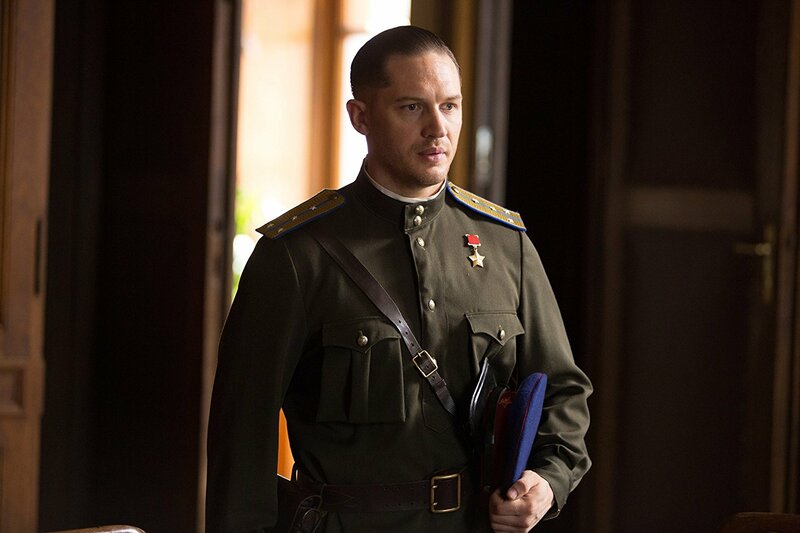 Tom Hardy’s Demidov is also loosely based on the real-life character of Moscow police inspector Mikhail Fetisov who determinedly pursued the Chikatilo case for many years. Child 44 has clearly been intended as a prestige production. It has an amazing cast – from topliners like Tom Hardy, Noomi Rapace and Gary Oldman to smaller roles from Vincent Cassel, Charles Dance and Jason Clarke, even Irish actor Paddy Considine unrecognisable as the killer and the new Robocop (2014) Joel Kinnaman as Tom Hardy’s nemesis on the force. Tom Hardy is quickly establishing himself at the forefront of the top British actors in the world. Here he does some astonishing things with the role. Even if the story is slow, it takes some way into it to notice as you are captivated by the process of watching Hardy act from the studied way he moves in interrogations to his moral rightness coming out and the closetedness of his emotions. The main problem with Child 44 is that it has a fantastically created milieu, some top drawer acting talent and is based on a fascinating true crime case but it fails to work as a particularly absorbing thriller. It is a long film, well over the two-hour mark and yet the script never keeps you pinned to it with its twists and turns or the unfolding and deduction of clues. Most of the detective work is ho-hum – as a detective, Demidov less impresses with his deductive genius than merely his dogged resolve. Paddy Considine’s killer is a shadowy figure who never has much of a presence in the film – we get to see very little of him and understand nothing of his internal drives. Certainly, the film is good at depicting its milieu, it is just that we never get much of the detective story that the film promises to be. Daniel Espinosa subsequently went on to make the science-fiction film Life (2017). 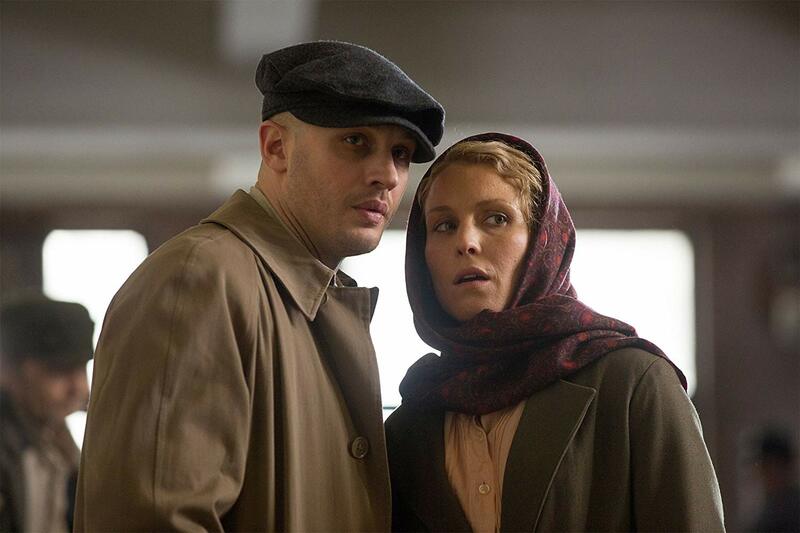 (Nominee for Best Actor (Tom Hardy) and Best Production Design at this site’s Best of 2015 Awards).